Marshmallows are made up of basically just sugar, water and gelatin, which makes them completely dairy-free. One simple recipe, endless possibilities. I love that about cooking and baking. Really it’s the key to becoming a great cook. Take a great recipe and try different variations. We teamed up with Country Crock® whose buttery spreads are creamy and perfect for cookie making as a family. 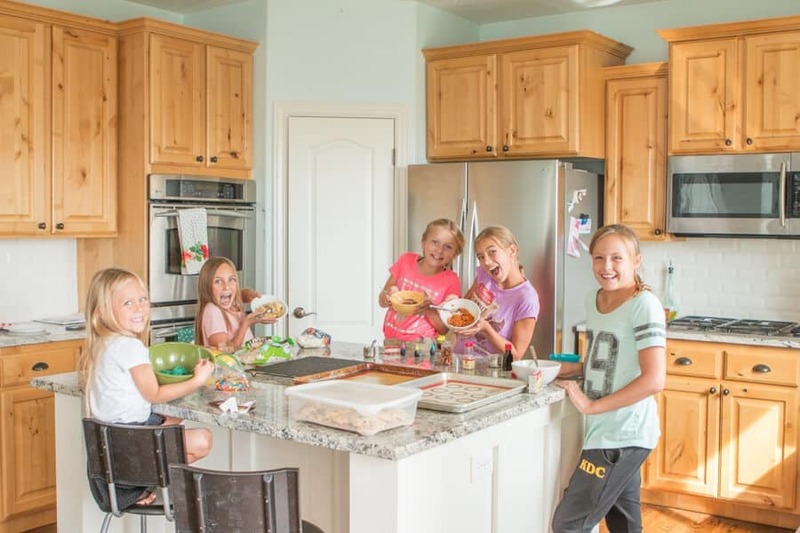 We not only got creative as a family but we are a big fan of getting to know our kids’ friends and creating a place where they can all have fun in a safe, happy environment so we let the girls all come over to a little baking challenge. The new school year inevitably brings on cooler, fall temperatures. When the chillier days call for indoor activities, the Country Crock® Make It YoursTM cookie recipe is an easy way to have fun and spark creativity with your kids and their friends. Cade and I kept it simple, chocolate, milk chocolate toffee bits and on a whim marshmallow which we cooked the cookies long enough that it kind of caramelized inside of the cookie. It’s awesome. The girls on the other hand, well we had a lot of sprinkles, food coloring, m&m’s, graham crackers and even this super cute halloween version. And get this, she used 8 green and 3 pink from our Neon food coloring and it turned the cookies orange! I wouldn’t have even thought to try that! 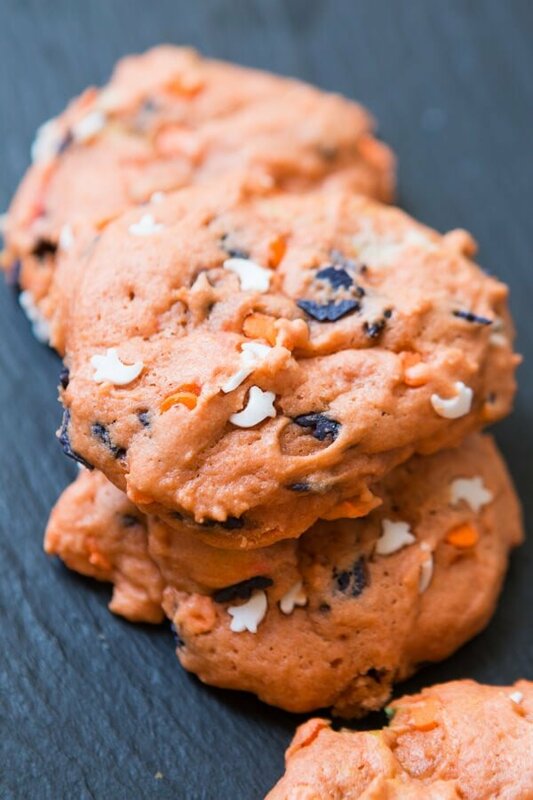 Add some Halloween sprinkles and you’ve got yourself a super cute cookie. 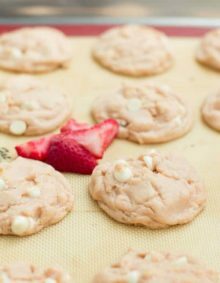 To prevent cookies from becoming stale, cover them with plastic wrap or keep in an airtight container when not serving. 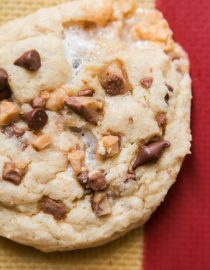 Visit CountryCrock.com for the Make It YoursTM Cookie Recipe and more baking inspiration. You can also join the conversation online using the #MakeItYours on Facebook, Instagram or Pinterest. For recipes and more visit CountryCrock.com. 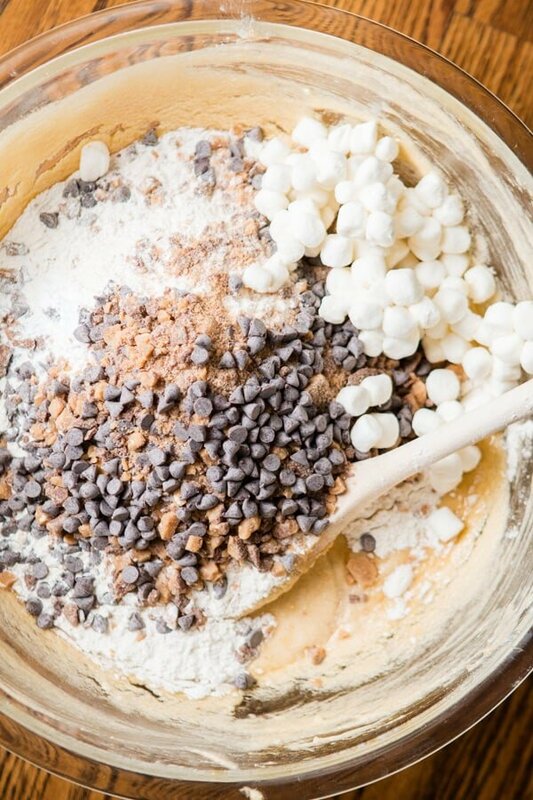 Do you have any favorite cookie ingredients that you and your family love? 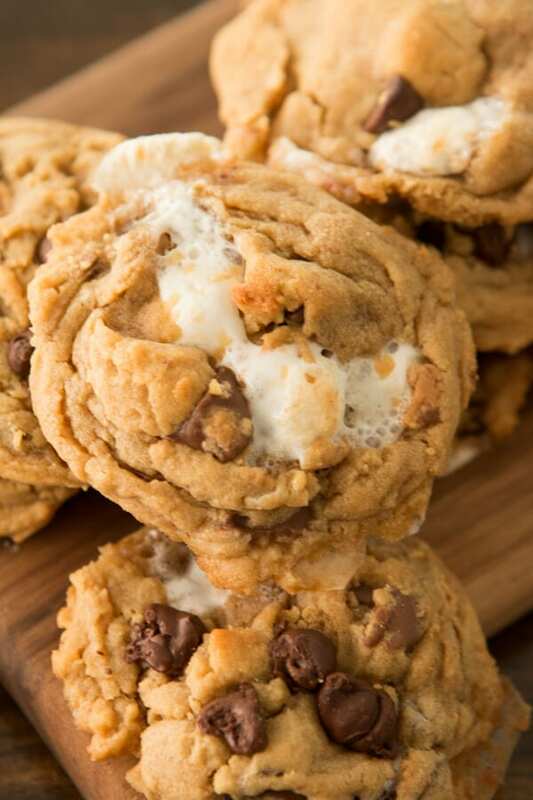 We would love to have you share them below as we are having so much fun with different combinations and loving these marshmallow toffee cookies. Will Cookies be OK Without Vanilla? Yes! 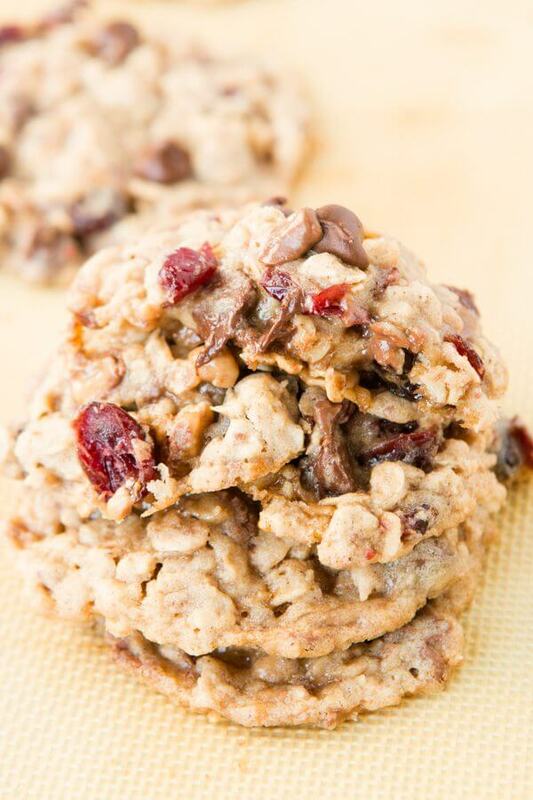 You can make cookies without vanilla extract. 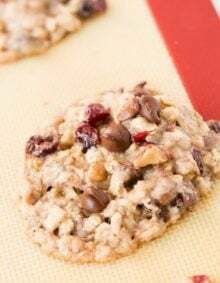 The only purpose of vanilla extract is to add vanilla flavor to the cookies, so they absolutely can be made without vanilla extract. Line a baking sheet with parchment or silpat liners. Mix brown sugar, granulated sugar, and Country Crock spread for about 30-45 seconds or until fluffy. Add the egg, egg yolk and vanilla and mix until well mixed. Hands down one of my all time favorite cookies, ever, ever, ever. There’s just something so awesome about that toffee, melty chocolate and juicy craisins. 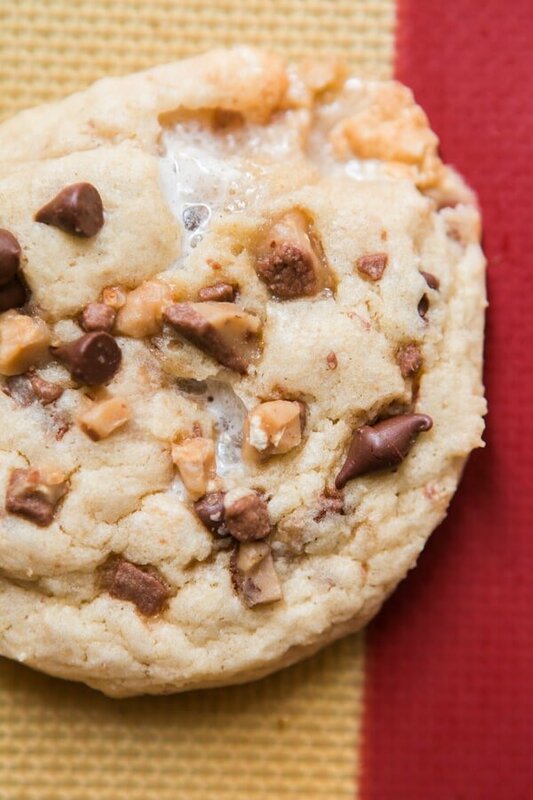 Fluffy, gooey marshmallow stuffed in a peanut butter cookie. Enough said. Whatever happened to this pie is entirely my fault. 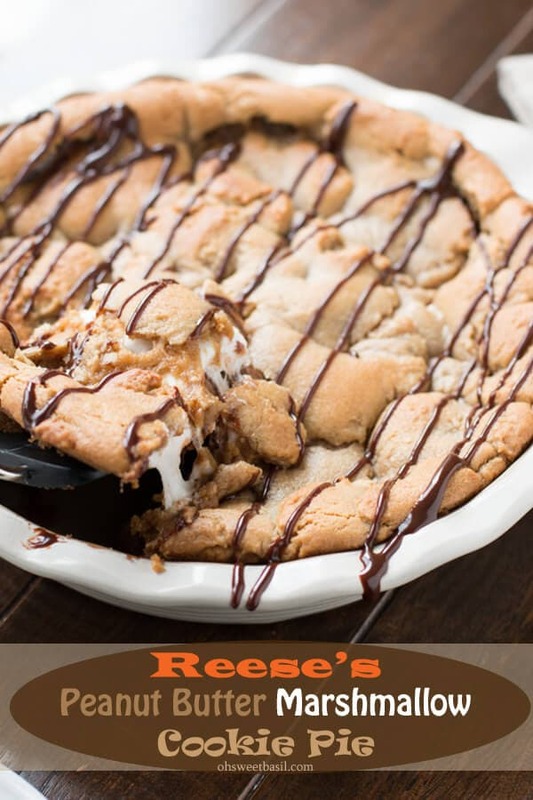 At first it was just going to be a cookie pie with chocolate but then there were the marshmallows and the reese’s and oh sweet mercy it’s good! 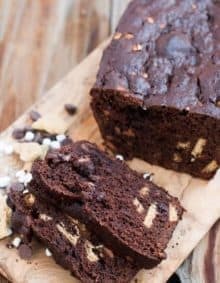 Can I use butter in place of margarine ? I tried it subbing 1 C. stick butter for the Country Crock. They turned out just ok. The dough was really crumbly. I had to work to get the dough to stay together. They baked up fine but it took more work than it should have. These cookies are DIVINE! The flavor combo…too perfect! It is definitely something I will have to try. Most don’t look appetizing, but I will try anything once. Definitely an interesting combination. OMG these cookies are off the charts. I am sure my little one will love them!!! 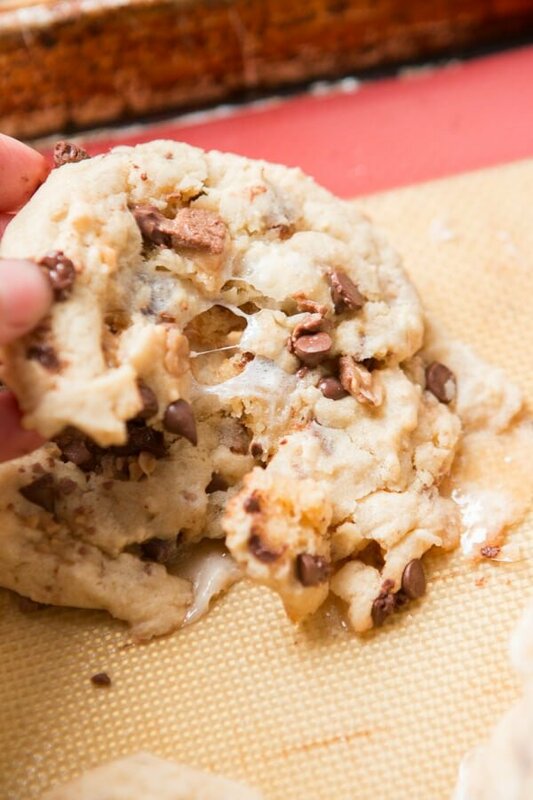 Marshmallow + toffee + cookies = cookie perfection! I need a dozen! I understand the need to seek sponsors to keep your blog going, but I really have a problem when a major ingredient is as Brand Name only!! Hi Frank, I’m not sure what you mean. Country Crock is the brand we worked with on this but it is ultimately each reader’s choice which brand they use. I don’t have a problem with it but I’m pretty sure what he’s trying to say is that the ingredient should say “margarine” if that’s what Country Crock is and then suggest that brand after that. Not everyone who reads a recipe has access to all brands and may not know what it is. Ah gotcha! Thanks for clarifying!